If you visited a website using Safari on your iPhone, you may suddenly receive a pop-up message about an Apple Security Breach and to call a toll free number to install protection software. You cannot go back in Safari and you cannot close the error message. In addition, swiping up to end the Safari app and re-opening Safari does not fix the error message from appearing. The error/website is impersonating Apple and is not an authorized Apple partner. 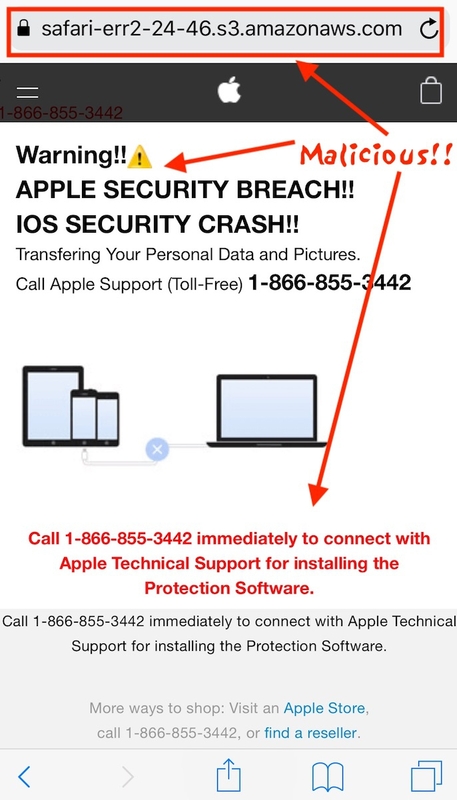 Call 1-866-855-3442 immediately to connect with Apple Technical Support for installing the Protection Software. Further, you may also receive an iOS bubble prompt similar to below. First, do not panic. This is a scam and your iPhone (or iOS device) has NOT been hacked. This is clearly a decisive message coming from a malicious website. Do not take any action the message suggests. Follow the steps below to clear the message and reset Safari immediately. Close out of Safari (Swipe Up) or click your iPhone home button. If you cannot, restart your iPhone by holding the power button. On your iPhone, go to Settings -> Safari -> Clear History and Website Data. This will completely reset Safari and clear any cache or cookies the malicious website may have put inside your Safari browser. Open Safari again and you should be able to browse normally again. If you continue having issues, please use the comment form below. Remember to report Trademark infringement directly to Apple using this form. I accidentally pressed the Call button once and then my phone wouldn’t do anything after that with because the message froze on my screen hovering constantly and not letting me do anything. I eventually did a hard restart. Once it restarted, I disconnected all WiFi and cellular and reopened the browser (it was Firefox), and this time the page didn’t load which didn’t lead to the message popping up. So I closed that page tab and deleted that link from my history. 1) Is my phone compromised? 2) Can they steal any data or info off my phone? 3) Is the app (Firefox) compromised? 4) If so what should I do? I accidentally pressed the Call button once and then my phone wouldn’t do anything after that with because the message froze on my screen hovering constantly and not letting me do anything. I eventually did a hard restart. Once it restarted, I disconnected all WiFi and cellular and reopened the browser (it was Firefox), and this time the page didn’t load which didn’t lead to the message popping up. So I closed that page tab and deleted that link from my history. My questions are: 1) Is my phone compromised? 2) Can they steal any data or info off my phone? 3) Is the app (Firefox) compromised? 4) If so what should I do? I accidentally pressed the call button. I luckily managed to do a hard restart to make the message go away. But has my phone been compromised? Has the app (was using Firefox)? If so what should I do? The took $400 I do I get it back ? While grousing over the impending loss of my unsaved tabs, I took a phone call. By the time I got back to my Safari, the malicious ad had blessedly changed to a different ad, and I was able to save my tabs. So that's a possibility. I still cleared the history and data for safety's sake. Just posting this for posterity. Thank you for the information! While grousing over the impending loss of my unsaved tabs, I took a phone call. By the time I got back to my Safari, the malicious ad had blessedly changed to a different ad, and I was able to save my tabs. So that's a possibility. I still cleared the history and data for safety's sake. Just posting this for posterity. oh my mistake.. finally my iphone's safari is working!! but is my phone safe? I'm worry about it because I click 5times to call button.. Also I follow this information, and it is very helpful me!!. Thank you!! oh my mistake.. finally my iphone's safari is working!! but is my phone safe? I'm worry about it because I click 5times to call button.. Also I follow this information, and it is very helpful me!!. Thank you! !